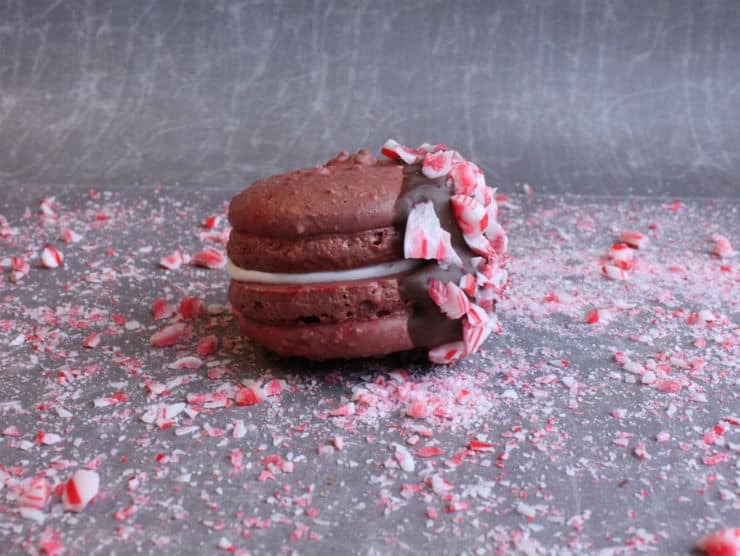 There’s just something about the month of December that screams chocolate and peppermint desserts to me. I mean, really, as soon as I flip the calendar and see those big, bold letters spelling out the word “December,” there’s just something in my mind that goes “Must… have… peppermint and chocolate!” Now excuse me while I go cuddle up in my Christmas pajamas, listen to Christmas music while looking at my Christmas tree, while eating some delicious chocolate peppermint goodies! Start by preheating your oven to 200* Fahrenheit (95* Celsius). In a large bowl (or a stand mixer if you have one), beat together your egg white powder and water, OR the eggs whites and egg white powder. I’ve tried both and I feel like the shells come out very similar so I usually just use whatever I have on hand. Beat until frothy. Add the granulated sugar and beat on high until stiff peaks form (about 6-8 minutes). If you want very smooth macaron shells, pulse your almond flour for 2-3 second intervals in a food processor. My food processor had a slight meltdown, so I’m currently without one, but the macarons taste every bit as good (just a little less smooth on top)! Stir the almond flour, powdered sugar, and baking cocoa together, and gently fold them into the meringue with a spatula. Be careful not to overmix as this can cause your macarons to crack during baking. Once the dry ingredients are about 80 percent combined with the meringue, add your red food coloring and continue folding. Spoon the meringue mixture into a piping bag with a large, round tip and pipe the macarons onto a parchment lined baking sheet. 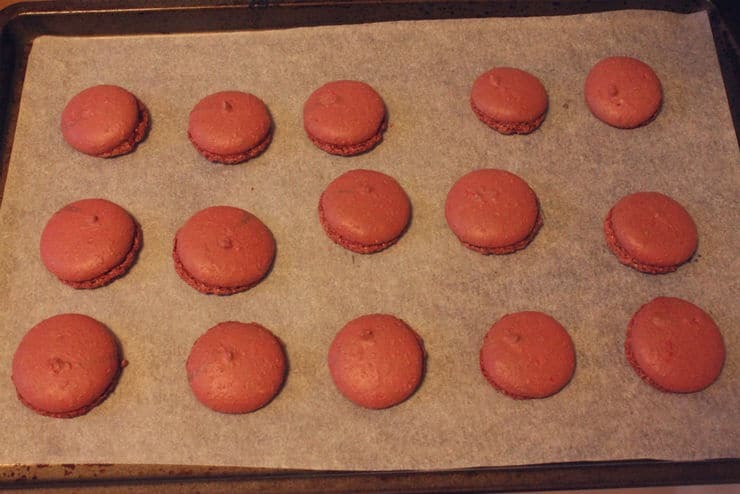 When piping macarons, it’s a good idea to have a template so that they’re all more or less the same size. For an easy, free template you can print out, Les Petits Macarons. Once your shells are piped, lift the baking sheet about 6″ from your counter, and bring it down a couple of times to bring the air bubbles to the top. Important note: only pipe as many baking sheets as you can bake at a time (for my tiny oven: one). I know our natural instinct is just to pipe everything in one go, but macaron batter will dry out very easily when exposed to air, which can cause a lot of cracking when they bake. So just pipe what you can bake, fold the large, open end of the piping bag under (so the batter doesn’t all flow out the back), and set it upright in a cup while you bake. 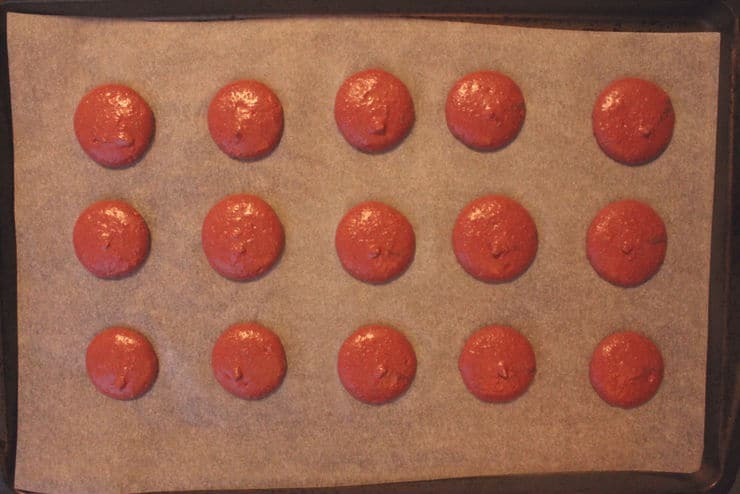 For average size macarons, bake them at 200* Fahrenheit (95* Celsius) for about 15 minutes, then crank the heat up to 350* Fahrenheit (175* Celsius) and allow them to bake for another 9-11 minutes, or until you can pull them from the parchment paper without any sticking. Be sure to watch them carefully as they take very little time to go from nicely baked to black and charred (yeah, that’s past experience speaking…). Also be sure to let your oven cool back down to 200* Fahrenheit (95* Celsius) before putting the next batch in. 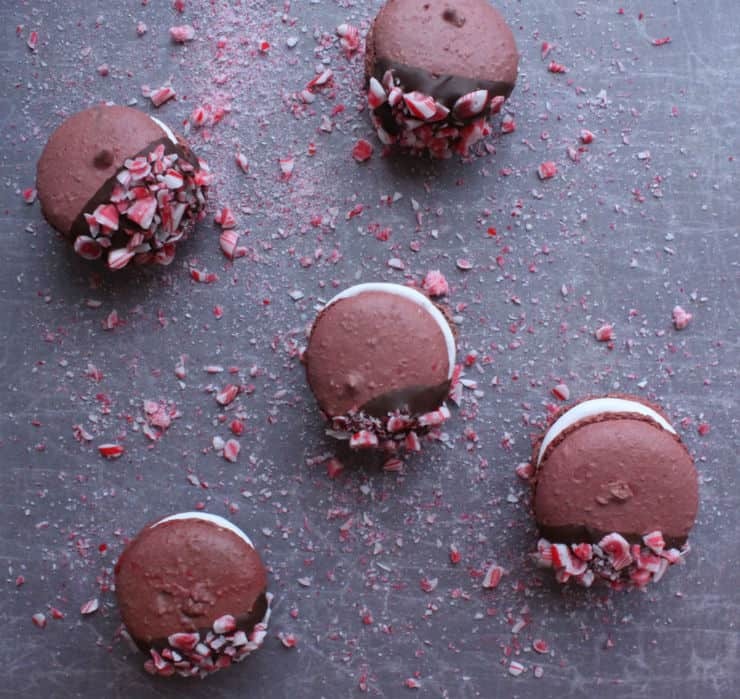 While the macaron shells cool, you can whip up the peppermint meringue filling! 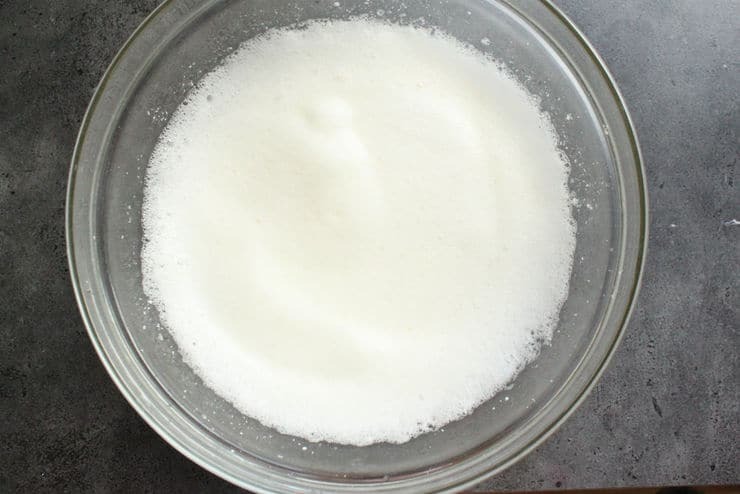 In a large bowl, whip together your egg white powder and warm water. 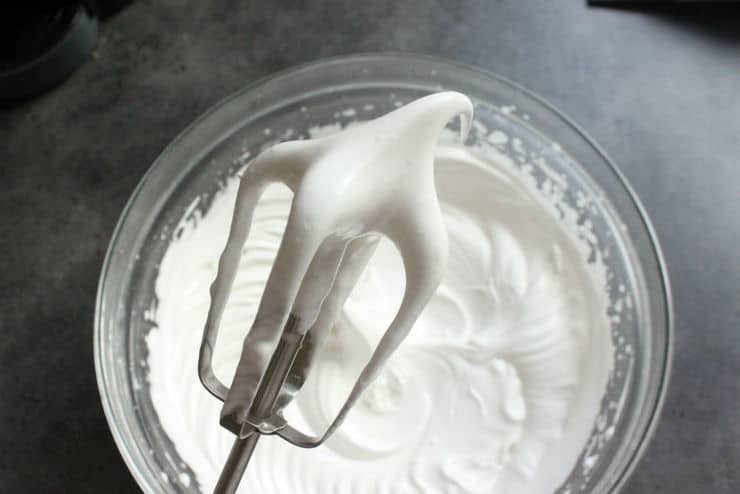 You can use normal egg whites as well, but I tend to steer clear of them whenever I’m not cooking my meringue (like in this recipe). Once the whites are frothy, add the powdered sugar and beat to a soft peak (a few minutes). Add the peppermint extract and beat until hard peaks form. Spoon the meringue into a piping bag with a large tip or opening, and pipe the meringue filling onto half of the completely cooled shells. Top the meringue shells with one of the empty shells, and set aside to firm up. Now for the garnish! Crush 6 candy canes and place them into a small bowl. In a small, microwave safe bowl, melt the dark chocolate in 10 second increments. 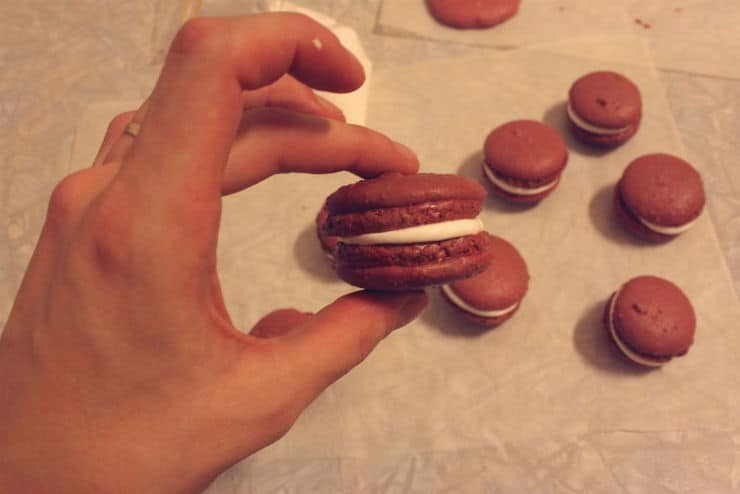 If the chocolate is really thick, you can thin it with a little oil so you get a thinner layer on the macarons. 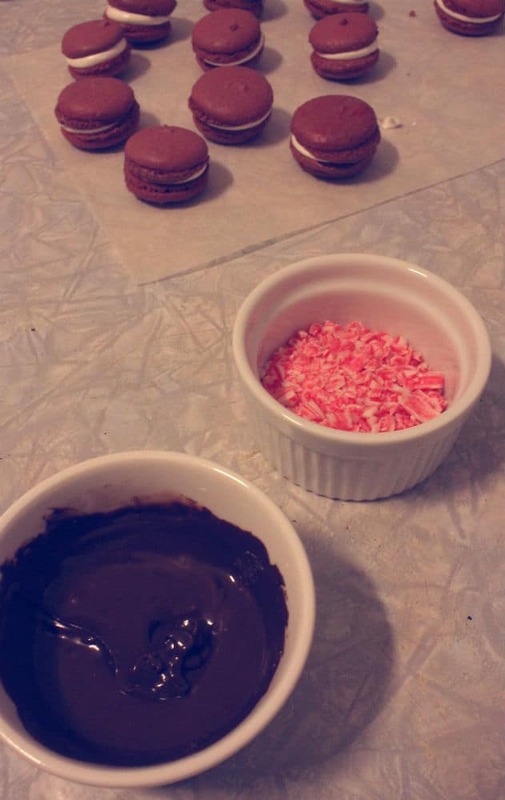 Dip each macaron into the melted chocolate (about half way) and then roll the chocolate part in the crush candy cane. Set it aside to dry on a piece of parchment or wax paper. Make sure the chocolate hardens all the way before packaging.